Offering a rare blend of oceanfront serenity and South Beach pulse, this spacious apartment in the landmark Roney Palace gives you the recreational amenities of the world-class 1Hotel resort along with a roomy pair of bedrooms from which you see nothing but sea, sand and sky. From the sun-splashed living room the full-size balcony overlooks the 1Hotel’s designer complex of pools, hot tub, palm trees, cocktail bars, eateries, games and gazebos. 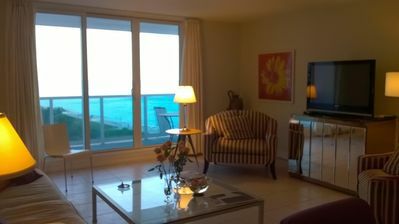 As a Roney Palace condo guest, you’ll have full access. In addition, when it’s repose you seek, you’ll also have use of a quieter, Olympic-size pool complex located on the landscaped south side of the Roney and dedicated to condo guests. 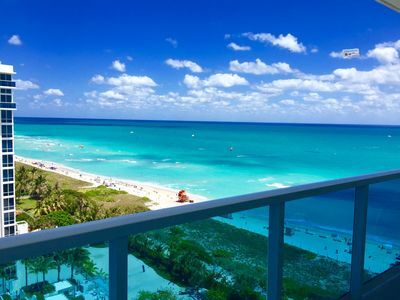 This splendid two-bedroom, two-bath, 1,480-square foot condo is located on the 10th floor of the Roney Palace, which shares its Miami Beach signature building complex with the renowned Hotel1 luxury resort. Your condo is directly on the ocean. From here it’s a few barefoot steps to the sea. And it’s a 15-minute walk (shoes recommended) to such South Beach landmarks as Ocean Drive and Lincoln Road, along a vibrant Collins Avenue humming with bars and clubs and fun-seekers from all over the world. 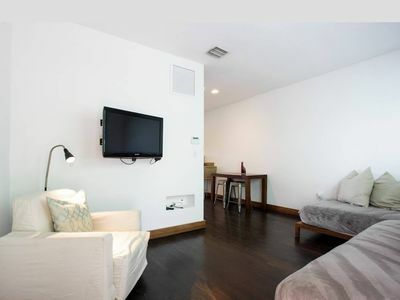 The condo features its own washer/dryer; a full kitchen with stove, microwave, refrigerator, dishwasher, and cooking utensils; linens and towels; flat screen TVs in the living room and master bedroom with HBO, VCR, DVD; and if you need to stay connected, high-speed Internet and landline phone with full service throughout North America. The Roney Palace features 24-hour security, and you’ll get free valet parking for your car.